Staff photo by Steve Muscatello New Ulm Cathedral second baseman Will Schabert (2) throws the ball to first baseman Aaron Portner during the Greyhounds’ 20-3 win against Buffalo Lake-Hector-Stewart Monday at Mueller Park in New Ulm. NEW ULM — For the third straight Tomahawk Conference baseball game, the New Ulm Cathedral Greyhounds won by the 10-run lead rule. The Greyhounds used 12 hits, eight walks and six errors to score a season-high 20 runs as they steamrolled Buffalo Lake-Hector-Stewart 20-3 Monday afternoon at Mueller Park. The game was stopped after 4 1/2 innings because of the 10-run lead rule. The second game, scheduled to be a five-inning, nonconference meeting, was cancelled due to field conditions. Cathedral has scored 42 runs in the last three games. Tony Geiger got the win for Cathedral (8-3). Geiger went two innings and allowed two runs on one hit. That hit — a two-run double off of the bat of Nate Schultz — was the only hit of the game allowed by Geiger, Sam Knowles and Alex Hillesheim. The two baserunners came off of two Geiger walks. Knowles pitched two innings with Hillesheim tossing the fifth inning. Dylan Maiers took the loss for BLHS (3-8) He was charged with eight runs in two innings. Josh Seidl, Sam Knowles, Geiger, and Will Schabert each had two hits. Seidl and Schabert each had three RBIs. The same could not be said for the Mustangs. The Mustang pitchers issued eight walks and hit three batters. After BLHS scored two runs in the first inning, they did not get a baserunner until the top of the fifth when they scored a run. And defensively, the Mustangs had eight errors. 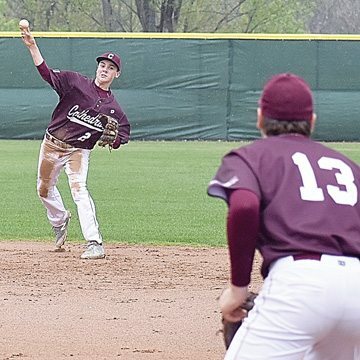 The Greyhounds, who play Minnesota Valley Lutheran Thursday at Mueller Park in a big doubleheader, plated three runs in the bottom of the first when Nate Hauser singled and Josh Seidl walked. 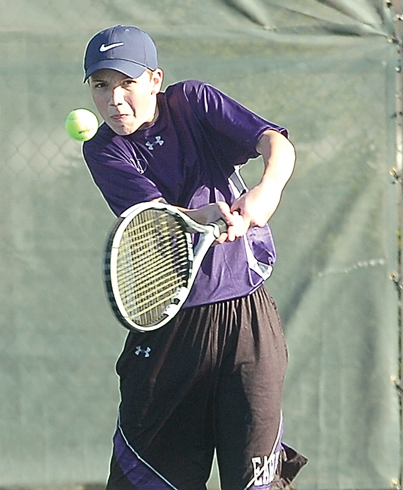 An Alex Hillesheim single scored Hauser. Aaron Portner walked to load the bases before Sam Knowles singled in two runs. Cathedral added five more runs in the second inning, all after two were out. After a Schabert lead-off single, Mark Schommer laced a two-out base hit that scored Schabert. An RBI single from Aaron Portner, a passed ball, a Geiger single and an error moved the Greyhounds into an 8-2 lead. Cathedral sent 13 batters to the plate in an eight-run third inning that saw just two Greyhound hits but three BLHS errors and four walks. Cathedral would push four more runs across in the bottom of the fourth for a 20-2 lead. Weier said that playing in a game like this is toughest on the pitchers.